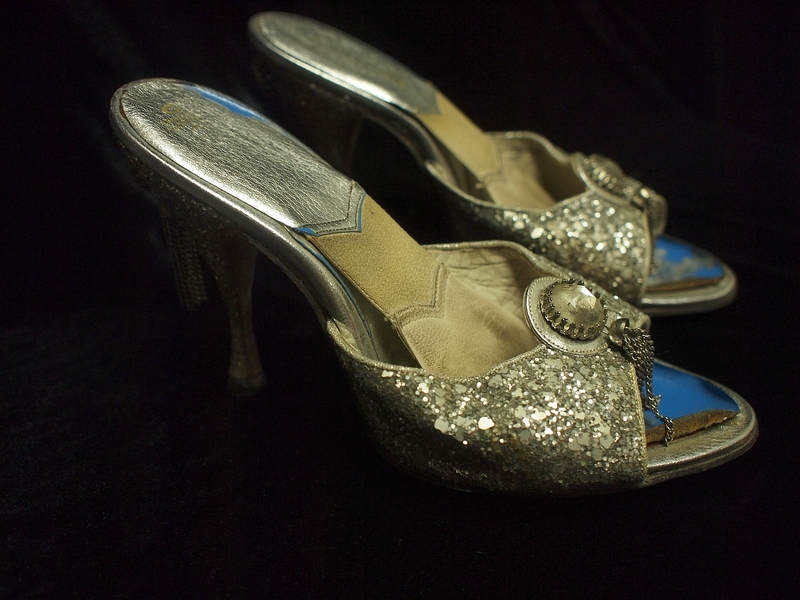 We recently added to our collection a selection of stage jewelry, shoes, and a dress, all from the career of Patti Starr. Now in her 90s, Patti Starr performed in the mid-20th century before marrying an oil man and retiring… for a while. She was a close friend of Jennie Lee and was around at the very beginning of the Exotic Dancers League, though she doesn’t seem to have been very much involved. We were able to record an interview with Patti, which we’ll add to our oral history collection, but right now we want to focus on her shoes. And oh, what tremendous shoes they are! Patti is a small woman, and has small feet. Really small feet. Like, really small feet. 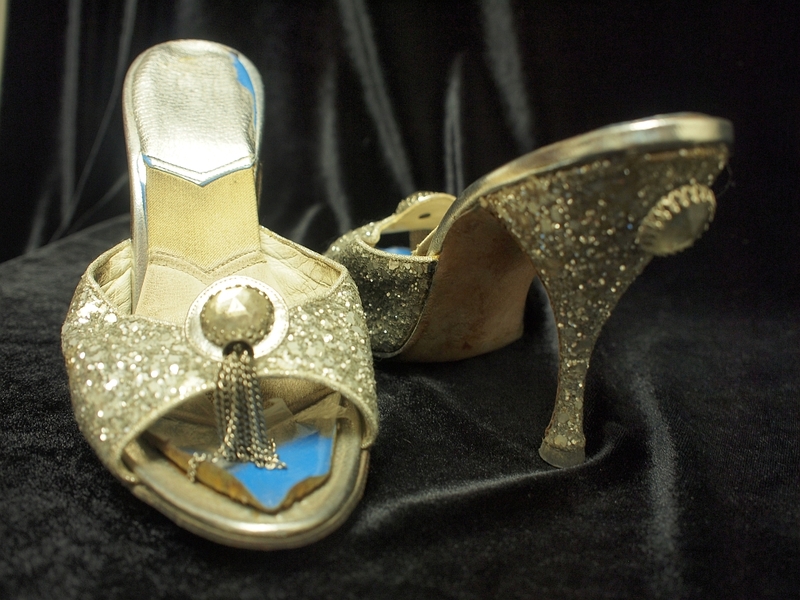 We have a pair on display in the museum and the first thing anyone says when they see them is “Oh, look at these tiny shoes!” These are women’s size 4, covered in silver glitter, with tassels on the top and the heel (missing from the left shoe). Aside from the size, what’s most notable about these shoes are the elastic straps along the instep. Marketed under the brand name Spring-O-Lator, these straps held the foot in place and prevented the shoes from going “slap slap slap” against the bottom of the foot, allowing for shoes without heel straps. Obviously, this was great for dancing, as it reduced the likelihood that your shoes would stay on the ground when you lifted your foot up! You can see Patti in a pair of strapless shoes in the photo below. The Spring-O-Lator went out of fashion somewhere along the way, although there have been some recent efforts to revive the design.